Well we sent my naughty nieces off with my parents to Thailand for their yearly trip. Before they left my mom made these awesome neck pillows for them that are just their size. They are a little thinner in the back part so it’s more comfy for their little bodies instead of having them stick so far out from the chair if they used adult sized ones. The girls picked their own fabric and these came together super fast. Make yourself a pattern you can get the basic measurements off of the picture of the pattern my mom made above. It would fit in a square that’s about 11 x 16 . Cut it out on the fold of the fabric to the right. And you’ll need two of those a front and a back. With right sides sew around all edges leaving an opening ( she did it on the inside part where the neck would go). Flip the pillow right side out. Stuff with batting. Hand stitch the hole closed. And our little friend who just turned one was over and this size seemed to work for him so I’d think this would be a good size for kiddos one to maybe 6 ish. My eldest niece is 5 right now. This couldn’t have come at a better time for us. With our vacation happening soon, I wanted to make these for the girls. Thank you for sharing. I’ll send you pics when they are done. This is a fantastic project! My daughter is ALWAYS complaining in the car because it is uncomfortable. These are the perfect solution! Would you consider linking it up at my Pinworthy Projects Party? I hope to see you there! What a brill idea – they look great! Love the colors and patterns too. Very cool post! Thanks for sharing this great idea! These little pillows are a great idea. Such a better alternative to having the kids pack their bed pillows on a road trip. I love it! I followed you over from the Sweet Sharing linky party. I would love if you stopped by my blog. Your travel pillows look fantastic! We travel a lot, and I always wish I had one of these with me! Wow – such a great idea. They do need smaller pillows. I already pinned this!! Thanks for linking up at Romance on a Dime! What a great idea! Those would be great for summer road trips! I would love for you to share this (and any other creations) at Pin It and Win It Wednesday @ http://www.cheapcraftymama.com– where you can win free ad-space on my blog! These are great Marissa. I can see a lot of moms and grandmas making these during the next few months for vacations. Thanks for sharing this useful craft at Your Cozy Home Party! Great idea-b/c that’s a super long plane ride. These are SO CUTE! :) Thanks for sharing! Oh!! I need one for me!!!!! Great idea Marissa!! Thanks so much for sharing at The DIY Dreamer.. From Dream To Reality! Can’t wait to see what you link up tomorrow!! wow. so cute,so fluffy and very useful. i think ill make one for my little angel.. its cloth print will be hello kitty ;) her fav. character. 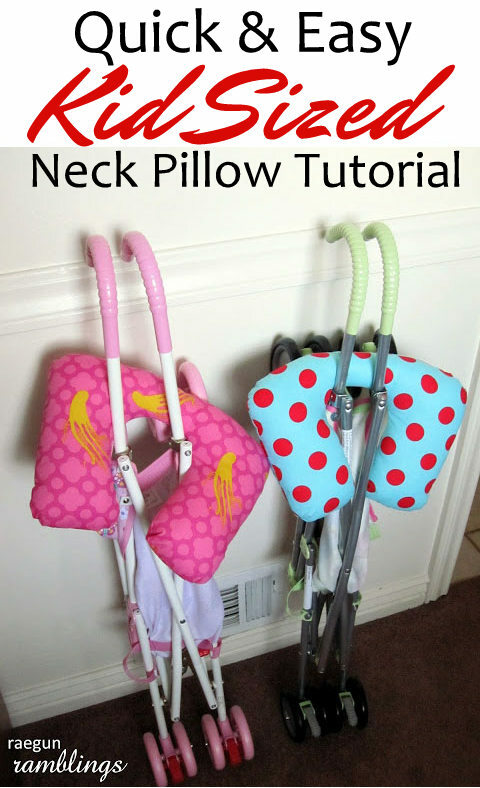 The information on the travel neck pillow tutorial is very helpful for many people. Nice Sharing! Have a Good News Today for All! DreamTimeInc.Com offers Neck Pillow at Low Price.Just go to our Website to compare the Price. How much bigger would you make these for a 7 and 9 year old?